The Bridgewater Canal has been closed since 2nd November 2015, just to the west of Worsley, for the installation of stop gates. 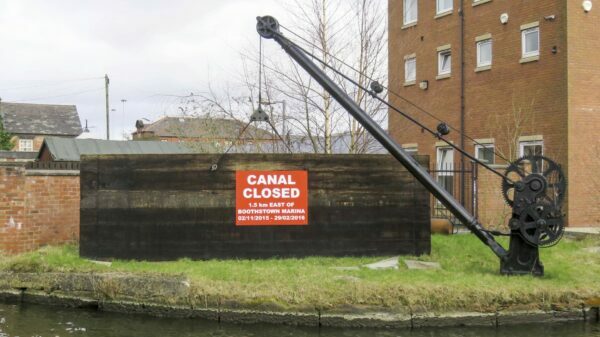 Large warning signs at each end, like this one at Leigh, handily positioned on the stop planks for a photo opportunity, tell boaters it will be closed until 29th February 2016. 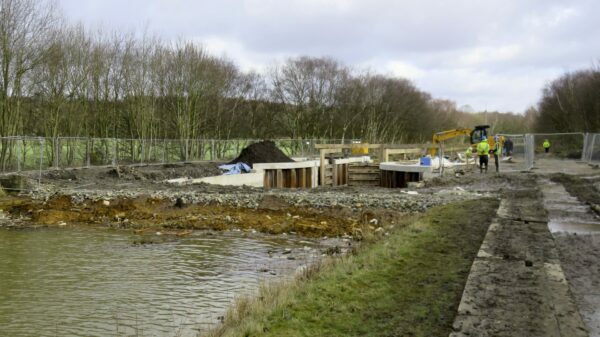 Cycling along the Leigh Branches of the Bridgewater and Leeds & Liverpool Canals yesterday to check the data for my maps is up to date, I passed the work site as they were nearing completion. The stop gates have been added at the Leigh End of the narrows for a former lift bridge which explains the old stonework in the photo. Peering under the arm of the digger we can see one pair of stop gates closed and pointing towards us, with another pair behind them in the open position and pointing in the opposite direction. 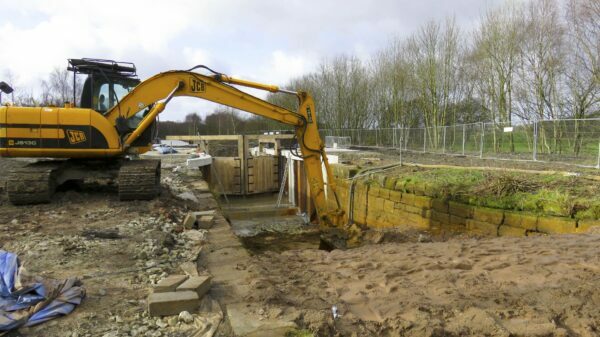 With long lengths of lock free canals it’s important to be able to stem the water flow in either direction in the event of a breach. 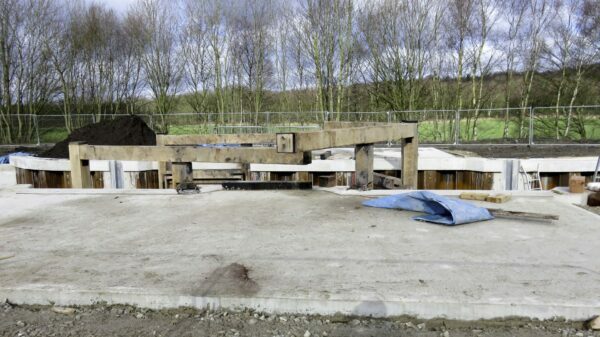 The side on view show the gate beams at different heights so they can be opened and closed independently. These pairs of gates follow the convention of pointing away from each other. The water between them can be pumped out during tests every few years to check the gates successfully hold back the water. 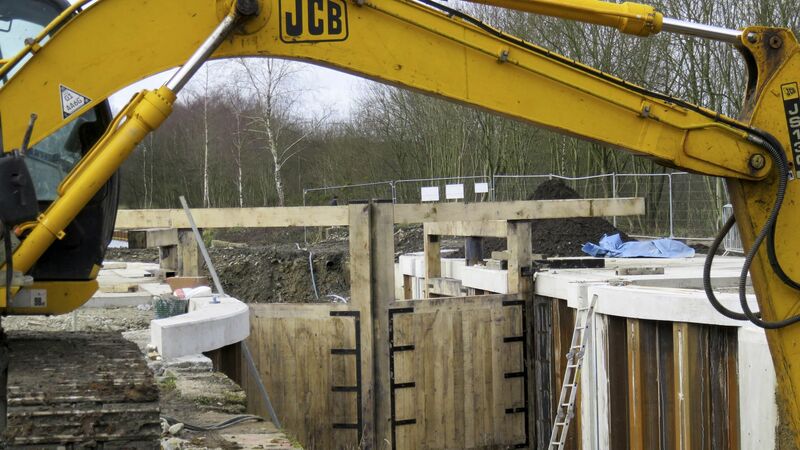 They were clearing up the site as I passed and starting to take down the safety fencing. They said they would breach the dams in the next day or two to check it all worked. If they do that with the gates closed they can test for leaks into the central section which should remain dry, at least until filled by the inevitable small leaks, but that might cause another problem. I could see no sign of any paddle gear and, having been separated for months the two ends of the canal are unlikely to be at exactly the same level. When the leaks have filled the central section then one set of gates can be opened but any difference in water levels will still hold the second pair shut. There could be a long wait until the levels in the two long pounds can be equalised if they test the gates this way. Removing the dams with the stop gates open, and testing by pumping might be a better solution. Boaters who have been waiting for passage, like Tom and Jan on Waiouru, should find the canal open next week as planned. UPDATE: New photos of the opened gates. This entry was posted in Leigh Branch, Leigh Branch (Bridgewater Canal), Waiouru by Paul. Bookmark the permalink.